Don’t you love lily ponds? I’m attracted to almost every one I see and for some time now I’ve wanted to try painting one. So today I decided to give it a go with a quick 8×8 study done in oil pastels. Working on pastel paper, isn’t the best for spreading oil pastels, I decided to use Senneliers (brand – creamy as butter) which worked out just fine. There was a lot to learn about water reflections, the lily pads and flowers – from proper values to colors. In the end the primary must do right with the piece, was getting the values correct and then making sure that I added lines for water ripples so the viewer could distinguish reflection vs. actual pad or flower. The little flower petals were my challenge . . . small areas that need good detail and edges are something I need to work on in future paintings. I’m sure I’ll try another, but for now here’s the study . . . The reference image was from Norm Rossignol from pmp. Another gorgeous painting I would love to see on my wall. Your artwork is truly remarkable. Hi Emily, thank you so much! This was my first lily pond – I’ve wanted to paint one for a long time and finally gave it a shot. I really enjoyed developing this piece and have three or four more scenes ready to go. Love the reflection in the water, beautiful colors and the light in the water. Thank you so much Petronette! Thanks Marysue, really appreciate hearing from you!! Hi Mamie, thanks very much for your generous comment! Looking forward to seeing some new paintings from you!! Love it! You’re so talented! Very kind Cha, thank you so much for your comment! Hi Mona, thanks very much for your kind comment! Mary love them and you make them even better… super reflection and water also. Hi Doron, thank you for your lovely comments!! It’s a fascinating process, Mary. 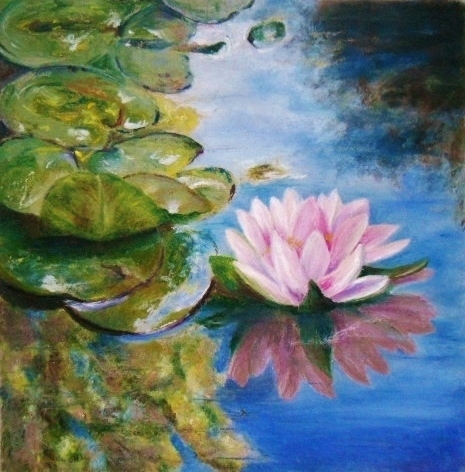 Lily ponds are my favorites; when I was teaching I had three huge posters of Monet on the walls. Students found them both calming and inspiring, and this was in a literature class, not an art class! It is so beautiful!! I think you managed to paint reflections perfectly! Well I think you nailed it! the leaves and the reflection are incredible. Wow! That is a beauty for sure. This study looks like a painting to me! 😀 Wonderful reflections and composition as well. Thank you Patricia, there are parts of it that I wish I could do over but with OPs I can’t scrap all the OPs off down to a clean surface. I learned a lot with this piece though – thanks for mentioning the composition it’s what attracted me to the scene. You’re very nice Scott, thanks for your wonderful comment! Hi Annie, thank you! 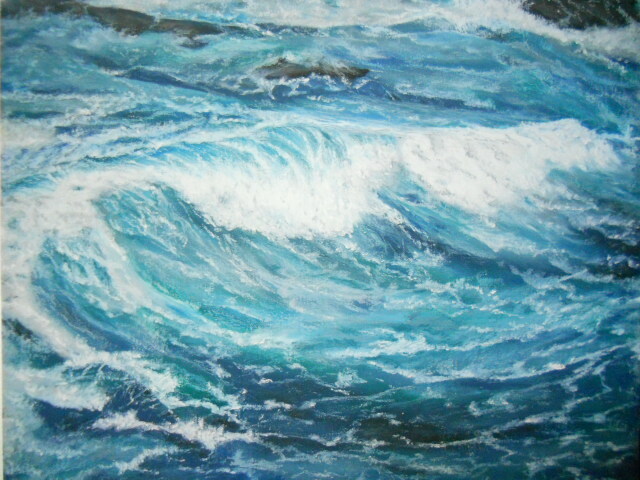 It was a fun painting to do with oil pastels – looking forward to trying one again. Thank you I really appreciate hearing from you on this piece! Gorgeous, Mary! The reflections are marvelous as is the leaf reaching to the sky! Thank you Marina – very kind, appreciate it! Sorry Mary, meant to put your name my note – Mary sounds so much better than Mpkarts!